Dozens Dead, Scores Injured After Bomb Blast In Nigeria : The Two-Way The explosion at a bus station near Abuja is thought to be the latest in a string of such attacks by the extreme Islamist group Boko Haram. More than 70 people were killed. More than 120 were injured. A bomb blast and explosions that followed killed more than 70 people and injured more than 120 on Monday near Nigeria's capital, Abuja. Early speculation is that the attack was the work of the Boko Haram extremist group. 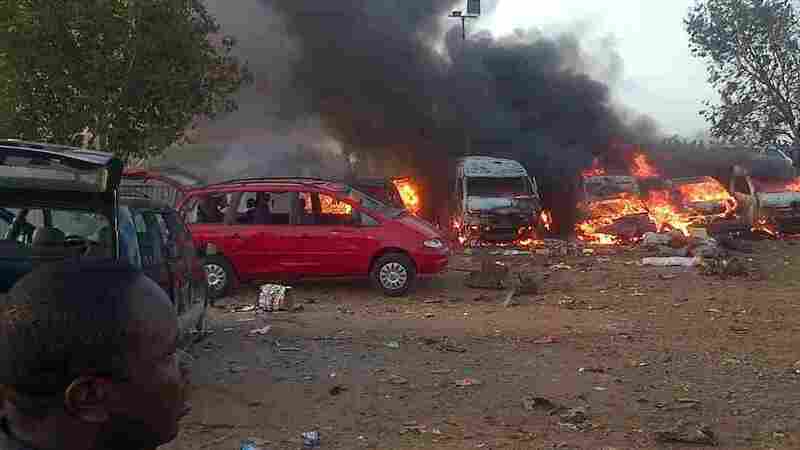 A rush-hour bomb blast Monday at a bus station near Nigeria's capital and other explosions that followed are thought to have killed more than 70 people and injured more than 120. An Islamist group that believes Western education is sinful and takes other extremist stands is being blamed. "Fingers are being pointed at Boko Haram, the terrorist network that has been threatening to attack Nigeria's capital," NPR's Ofeibea Quist-Arcton tells our Newscast Desk. She adds: "Three years ago, Boko Haram claimed responsibility for a deadly suicide bombing at U.N. headquarters in Abuja, killing 21 people. Abuja is hundreds of miles away from the northeast, the main target area of the insurgents, where nearly 1,500 people have been killed this year." On Monday morning, according to the BBC, commuters were "about to board buses and taxis to go to work in central Abuja" when a bomb went off. It's not clear at this point if that was followed by at least one other bomb, or whether subsequent blasts were because fuel tanks in nearby vehicles exploded. As of 8 a.m. ET, Reuters was reporting that "the confirmed toll ... is 71 killed and 124 wounded so far, [said] police spokesman Frank Mba." The Associated Press added that "Mba says Monday's blast destroyed 16 luxury coaches and 24 minibuses."